Aortic dissection can be a misleading term that is often misunderstood. It is NOT a dissection through a transverse section of the aorta, but rather a longitudinal tear in the wall of the aorta that forms a false lumen. This can be caused by connective tissue disorders (such as Marfan Syndrome) and mechanical processes such as hypertension. Iatrogenic causes (such as those secondary to surgery) are also possible. 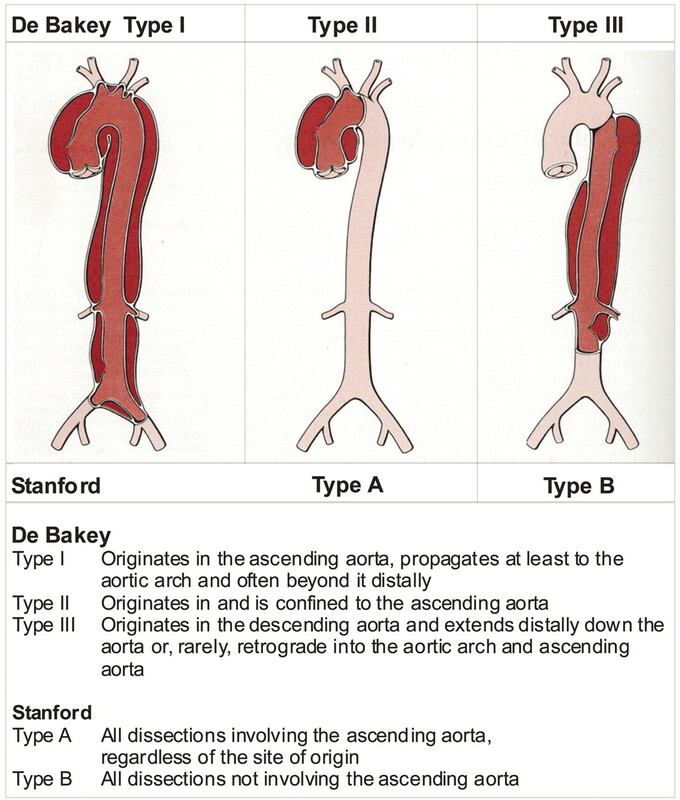 Stanford Type A: this is a proximal aortic dissection that involves that ascending aorta. It can extend to the aortic arch and even the dissenting aorta. It is often treated with surgery. Stanford Type B: this is a distal aortic dissection. It involves only the aortic arch and or descending aorta (no ascending aorta involvement). It is often treated medically with β-blockers, then vasodilators. The aorta is the largest artery in the body, and an aortic dissection severely compromises its structural integrity. Rupture of the aorta is very possible with an aortic dissection and will cause death very quickly. Chest pain: tearing chest pain with sudden onset is a common chief complaint. Pain can radiate to the back and can also be present in the abdomen. Blood pressure differences between both arms may be noticed as well. 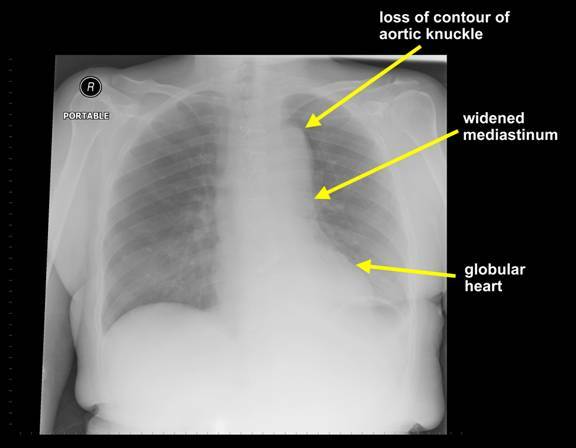 Chest X-ray: can show mediastinal widening which can be suggestive of an aortic dissection. Pleural effusion is also a common finding associated with this condition. Echo: The presence of the dissection flap may be present on echocardiography. CT scan can provide good visualization and measurement of the dissection. Obtaining imaging (Echo/CT) can help rule out other possible causes of chest pain/widened mediastinum on X-ray. The type and severity of of the aortic dissection will help inform its proper management. Initially all types of aortic dissection require medical management geared toward lowering the blood pressure of the individual. If life threatening aortic dissection, immediate surgical management/repair is required. Otherwise long term medical management involves controlleing the patients blood pressure with anti-hypertensive medications. This is a very deadly condition where prognosis is entirely dependent upon its rapid identification and management by health care professionals. Controlling/avoiding one’s hypertension can in some instances help prevent the occurrence of an aortic dissection. **DEATH** This is a potentially fatal condition. 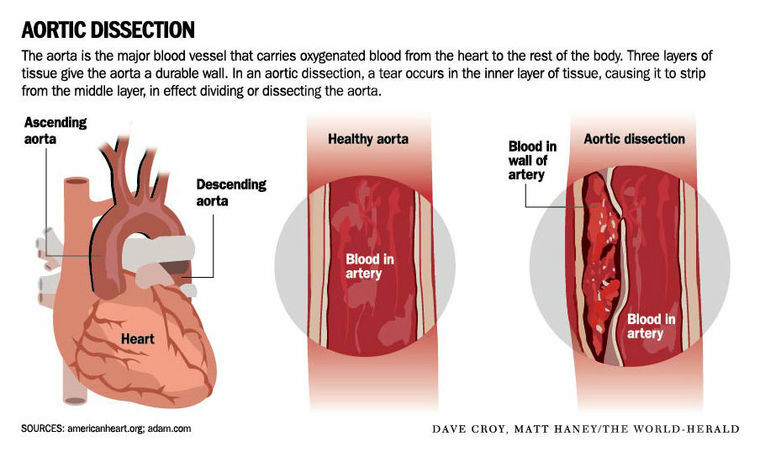 Rupture: the aorta may physically rupture leading to a very rapid death by the patient. Pericardial tamponade: a pericardial effusion can be caused by this condition, that ultimately compresses the heart. 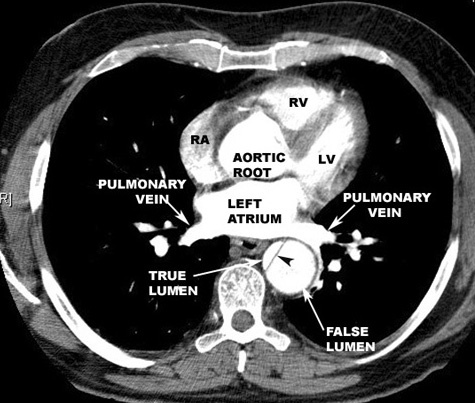 Aortic regurgitation: blood can backflow into the left ventricle due to an aortic dissection. Heparin is contraindicated in a patient with aortic dissection.